Are you coming to the Alphabet Bash August 9th? We'll be there! If you're a Twin Cities' MARCOM professional and plan to be at the event, I wish you'd stop by and say, "Hello." As a local inflatables manufacturer who's right here in town we'd love to get to know you. 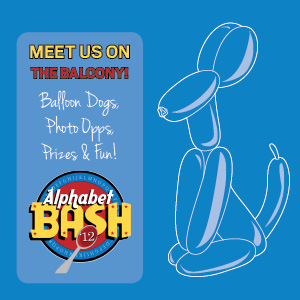 We're sponsoring a balcony and will have a balloon artist on hand to make super-cool balloon dogs. Capture the moment by getting your picture taken with your balloon dog then bring it home (or to your office!) as your new, best-buddy. But that's not all. We'll have lots of fun prizes to give away from local, Minnesota companies during & after the event. Click here to find out 3 ways you can walk away with some serious swag! In this issue of Landmarketing, you'll find an enormous selection of case studies to get your creative juices flowing. From superheroes to prehistoric creatures, there's a bit of everything in this marketing smorgasbord. What the heck's a mosasaur and why would you want one as your mascot? Because this type of dinosaur was an extinct marine reptile and dominant predator in its time. The excitement kids have for prehistoric creatures combined with the nature of the East Dakota Water Development District made it a perfect match. Kids love to see Cynde McInnis coming. That's because this whale enthusiast brings ultra-cool stuff with her when she arrives at their schools. By combining something fun with something educational, children are captivated and inspired to learn about the oceans and the animals that live in them. All this education comes in the form of a life-sized wildlife inflatable "whalemobile." Every single one of us probably knows at least one person who has arthritis. From your cousin who gets a twinge in her knee from time to time to your grandfather who can predict the weather more accurately than the weatherman, arthritis is everywhere. That's why the Arthritis Foundation goes to great lengths to support the 50 million Americans living with this leading cause of disability. Let's Face It: Cold-Air Inflatables Are Just Fun! When it comes to mobile marketing, E-Z Rent to Own knows how to do it right. About eight years ago they purchased two 20-foot-tall Captain E-Z cold air inflatables. These blow-up, monster-sized promotional balloons were tasked with some heavy lifting when it came to marketing.